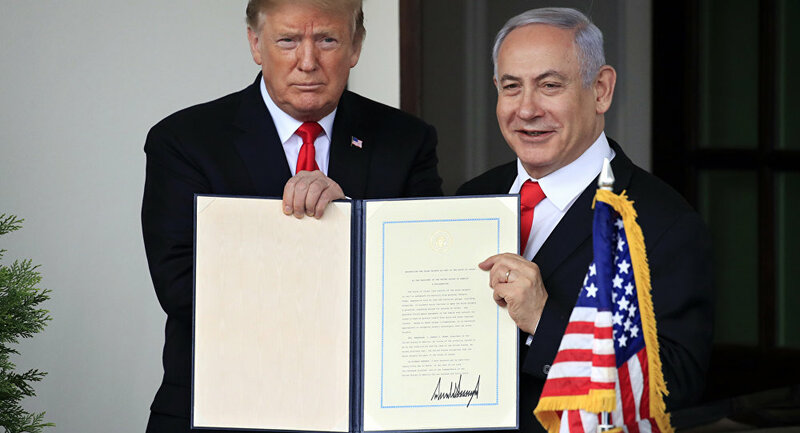 Last week, US President Donald Trump signed a proclamation formally recognizing Israel's sovereignty over the Golan Heights after meeting with Israeli Prime Minister Benjamin Netanyahu at the White House. The Golan Heights has been mostly under Israel's control since the country seized the territory during the 1967 Six Day War. While Israel adopted a law to annex the territory in 1981, the United Nations declared the move void, without any legal effects. In 2018, the UN General Assembly adopted a resolution urging Israel to immediately withdraw its forces from the territory after the country organized local elections in the area on 30 October. Arab League Secretary-General Ahmed Aboul Gheit has said that Arab countries unanimously recognize the right of Syria to the Golan Heights. Sputnik has discussed the issue with Milena Sterio, Professor of Law and Associate Dean for Academic Enrichment at Cleveland State University. Sputnik: What is Trump's personal goal in supporting Israel? What is his primary objective? Milena Sterio: Trump's primary goals and objectives: President Trump has consistently displayed his willingness to support Israel unconditionally, and he has criticized former President Obama for his own policies vis-a-vis Israel, which were more nuanced (for example, President Obama was not willing to recognize Jerusalem as Israel's capital, not willing to recognize Israel's sovereignty over Golan Heights, and demanded that Israel suspend building new settlements in the West Bank). Thus, President Trump's general objective is to strengthen Israel's position in the Middle East, as well as to weaken the position of those countries which are perceived as Israeli enemies (Syria, Iran, etc.). Sputnik: What will be the consequences for the US over this support? Milena Sterio: There may not be as many direct consequences for the US. It appears that the reaction of many Middle Eastern countries has been muted — many countries seemed ambivalent about this US move, and see this as part of American general support of the state of Israel. 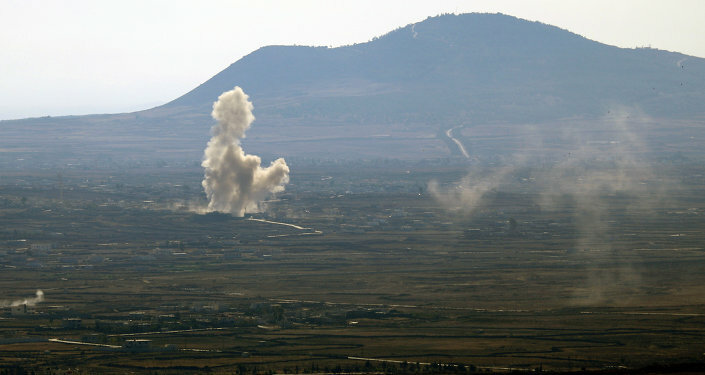 The most troublesome negative consequence of this decision is the potential this may have to destabilize the Middle East and to ruin any chances of a peaceful resolution of the Golan Heights conflict (as well as the Israeli-Palestinian conflict). The US will also face criticism from many of its Western European/Canada allies, who disagree with this decision. The US could also face a negative UN General Assembly resolution, condemning this decision. Sputnik: How will Trump's decision affect stability in the Middle East? Milena Sterio: The Middle East is already an unstable region, and this decision, coupled with the US recent recognition of Jerusalem as Israeli capital, has a great potential to destabilize the region further. 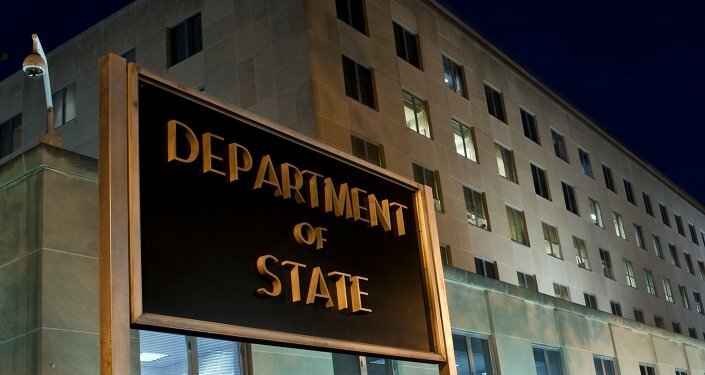 By supporting Israel, the US is removing all incentives for Israel to negotiate with the Palestinians and with Syria, which could cause lots of anger within Palestinian territories and in Syria, which can, in turn, fuel terrorism, extremism, such as ISIS[Daesh], and other violence. Other regional countries which support Syria may also be drawn into the conflict. Thus, the potential for destabilization in the Middle East is large. Sputnik: What could be the next steps to expect from Trump in support of Israel? Milena Sterio: What are the next steps? Most likely, President Trump will continue to support Israel unconditionally. This could translate into supporting Israel in its continued building of settlements in the West Bank, supporting Israeli construction and other business endeavors in the Golan Heights (there are talks of drilling licenses being offered to US companies in the Golan Heights), and supporting Israeli military efforts through arms sales. Views and opinions expressed in this article are those of Milena Sterio and do not necessarily reflect those of Sputnik. *Daesh (also known as Islamic State, ISIS, ISIL, IS) is a terrorist group banned in Russia and many other countries.